Click the icon on the left to use the currently selected text color (it is shown by the horizontal bar in the lower part of the icon). By clicking the arrow on the right, the Color Picker window will be displayed allowing you to select a color for your text. To change the color, select the text, click the Text Color button and choose a more convenient color from the Color Picker interface, described below. Click the icon on the left to use the currently selected highlight color (it is shown by the horizontal bar in the lower part of the icon). By clicking the arrow on the right, the Color Picker window will be displayed allowing you to select a highlight color for your text. To change the color, select the text, click the Highlight button and choose a more convenient color from the Color Picker interface, described below. 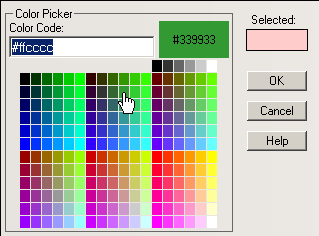 Note: You can define yourself the colors displayed in the Color Picker in a configuration file. The default colors are those from the Web safe color palette (216 colors) and some gray shades. Read more about this in the API documentation. When you launch the Color Picker window, the Color Code text box displays the code of the previously selected (foreground/background) color. Once you select a new color, the displayed code will change. Also, you can enter the hexadecimal code yourself. When you move the mouse above the color matrix, the color that has the mouse over it will be shown (as well as its code) in a larger rectangle on the right, namely the Mouse-over display item. Once you select a color in the matrix, its appearance will be shown in the Selected display item. Click OK to apply the selected foreground/background color to your text. Click Cancel to cancel any foreground/background color selection. The Help button opens the contextual help window.